Scotland is the homeland of the fiercest warriors the world has ever known. The giant William Wallace halved countless Britons with a six foot long sword in the name of Scottish independence, and was so vicious that the British decided to kill him three different ways when they finally caught him. Alasdair the Devastator got his subtle nickname for scorching 40 square miles of his enemies’ territory into smoldering ashes as revenge for his fallen clan. And never forget Connor MacLeod, who defeated the immortal Kurgan to become the one and only Highlander. Even the vikings knew better than to go to Scotland -- the kilted fury waiting for them there wasn’t worth the trouble. Why are Scots such phenomenal fighters? It’s because they’ve the best thing in the world to fight for: Scotland. From the haunting Hebrides to lush Dumfrey and Galloway, Scotland has brought us wonderful things like golf, television, Sherlock Holmes, single malt Scotch whisky, single grain Scotch whisky, blended malt Scotch whisky, blended grain Scotch whisky, and blended Scotch whisky. If you believe in honor and country, or you’re just pumped up by a chorus of bagpipes, then maybe you’ve a little of the spirit of Scotland in yourself. 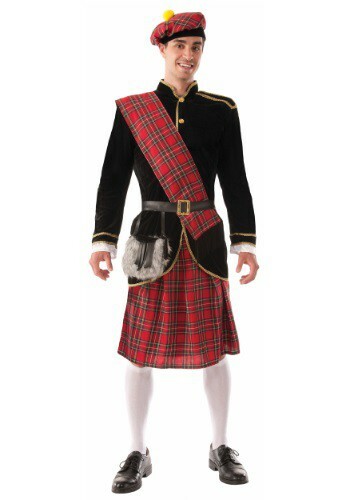 Wear our Scotsman costume, an ornate jacket and belt with traditional red tartan kilt, sash, and hat (known as a tam o' shanter). Whether you’re swinging a claymore or a 7-iron, you’ll look right at home in the Highlands!